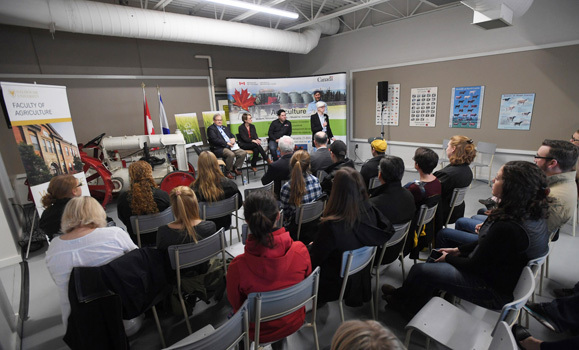 It was a full house on the Agricultural Campus farm this past Friday as students, alumni and young farmers filled seats to hear from and speak with Canada’s minister of agriculture. 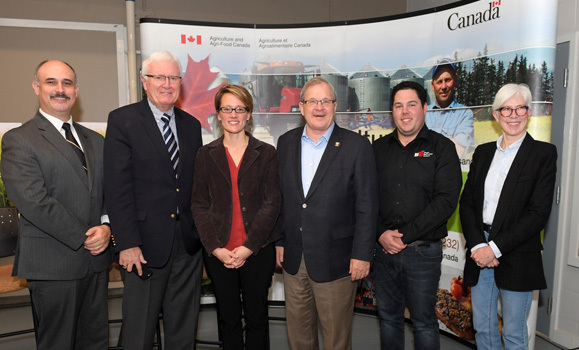 The Honourable Lawrence MacAulay hosted his first Facebook Live session from the Ruminant Animal Centre along with panelists and alumni Jolene MacEachern of the Cultiv8 Sandbox and Sam Bourgeois of Belleville Orchard. The goal: to engage young farmers and youth in agriculture. “Our government is committed to listening to the issues that matter most to young Canadians,” said MacAulay. “The agriculture sector needs to attract young entrepreneurs from diverse areas of expertise to ensure a sustainable and competitive industry for the future. The event was broadcast live on Facebook, with questions both from those in the room and online. It was moderated by Christiane Deslauriers, director general science and technology, Branch-Coastal Ecozones Agriculture and Agri-Food Canada. MP Bill Casey and Henry Vissers, executive director of the Nova Scotia Federation of Agriculture, were also in attendance. The agriculture minister, along with panelists, fielded questions and comments on a wide variety of topics including the Trans-Pacific Partnership Agreement, supply management, and technology and innovation. “It was a very good opportunity to have our federal minister available to get his answers and comments on issues that are relevant to youth in agriculture and both the opportunities and challenges that may present themselves in the future,” said recent alumnus Dan Muir. During the peak of the broadcast there were 150 viewers on Facebook with a total of 4,500 views, 95 comments and 76 shares. "We have so much work still to do in the school classroom. Young people don't understand what modern agriculture is,” said alumnus Jolene MacEachern and Cultiv8 Sandbox Coordinator. Dean David Gray echoed those sentiments. To view the broadcast, visit Agriculture and Agri-Food Canada's Facebook page.